Practicing since 1993, we offer effective and aggressive legal assistance. Are you looking for an experienced DUI attorney in Ashtabula, Columbiana, Geauga, Mahoning, Portage, or Trumbull County? If you, or a loved one, have been charged with DUI we may be able to help. 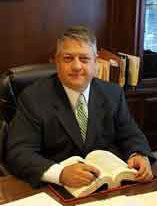 Robert C. Kokor handles all criminal cases including DUI charges. Robert C. Kokor provides legal representation in Ashtabula, Columbiana, Geauga, Mahoning, Portage, and Trumbull Counties and the entire Brookfield area. If you have been charged with a DUI, call our office now for a free case review (330) 946-2282. If this is an urgent matter please call 330-718-6394. I had a legal matter that Mr. Koker was very attentive in assisting my legal need fast and efficiently. He has also helped many other close acquaintances and I will continue to refer to others. University of Toledo College of Law, Lawrence, Kansas, 1993 J.D. Westminster College (New Wilmington), 1990 B.A. Robert C. Kokor 48 W. Liberty St.